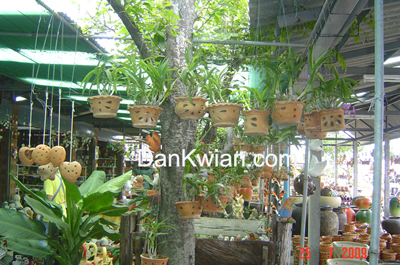 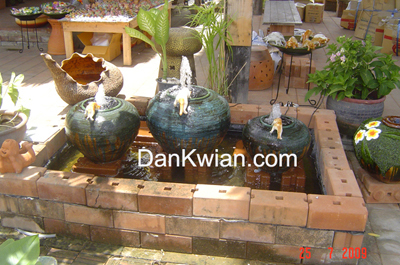 Dan Kwian The land of ceramics, is located in Tambol DanKwian, Chokchai District and is 15 kilometres south-east of Korat City. 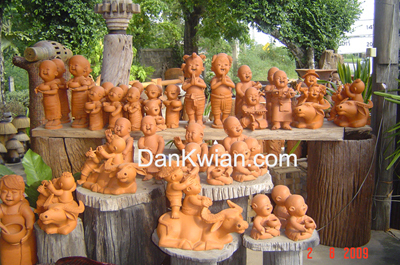 Route No.224 Nakhon Ratchasima, Thailand - Chokchai runs thougth the village where both sides of the orad are fulled of beautiful and astonishing ceramic shops. 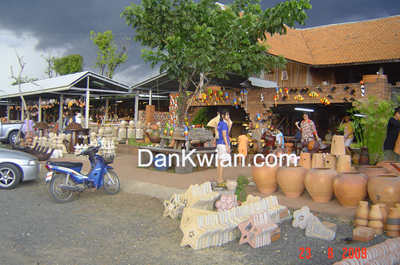 The moon River runs on the east side of the village. 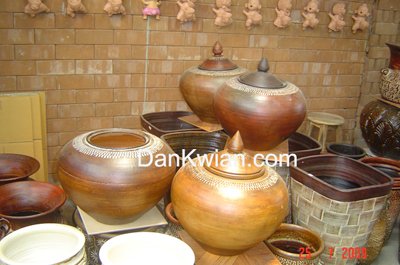 Dan Kwian Litter ally means the by-pass area of bull-carts. 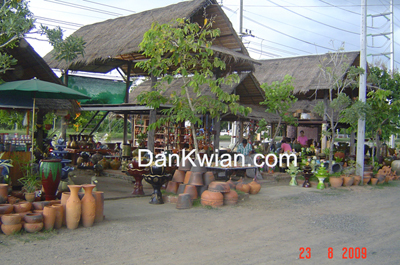 As told by the people, years ago, people from variousparts on the side of the country, for example, Nang Rong, Buri Ram, Surin, Khunhan, Khukhan and down to khamer regions, who had travelled west-wards in their carts, would normally camp their caravans here at Dan Kwian, During their stops, the travellers or the merchants would collect the raw clay from the banks of the Moon River for making earthenware-pots, jars, table wares etc. 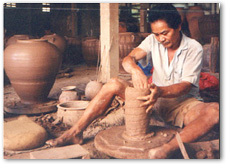 Shapes and designs were copied in traditionnal way as the 'Kha' tribe who originally lived there. 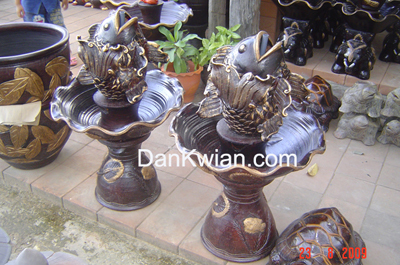 Many of those product wear taken back with the merchants and since the products from Dan Kwian had special charactoristics both in shapes and colors and also marverlous quality of tough, they became well know to all people everywhere. 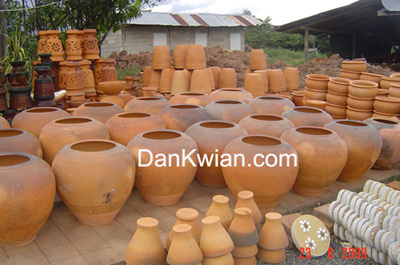 Today,the Dan Kwian products become one of the major export goods from Korat. 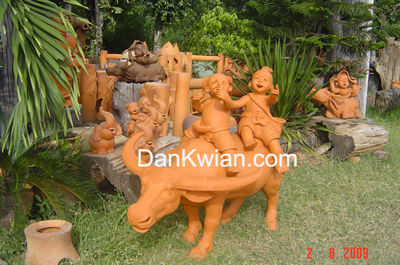 The clay at Dan Kwian has a special marverlous quality of though, as said, ductile texture and color of rust which beyond comparison and the quality is fantastic.The clay is taken from the banks of Moon River, the place locally colled 'Kud' (Parts of the river banks that have been worn away or eroded then created an area of swamp-liked).The clay is also well known for its features as forming shapes, and on the firing process, it is not easily broken or bending,The very most special feature is that after the firing the clay will give out natural red colour which is belived to be iron oxide mixed in the clay.